A mother of two is fighting to stay in the country after U.S. Immigration and Customs Enforcement agents arrested her and her teen son, both victims of alleged domestic violence, at a North Carolina courthouse earlier this month. The plainclothes ICE agents approached Maria, 38, and her son, 16, as they finished a hearing at Mecklenburg County Court, her public defender said. "I was heading toward the elevators and I saw Maria's 16-year-old son being handcuffed," Herman Little, her public defender, told ABC News. "When I got around the corner, I saw that Maria was being arrested and handcuffed. When I approached, one of the ICE agents told me, 'Get back, get back.' I said, 'What do you mean? I'm her attorney, this is my client.'" 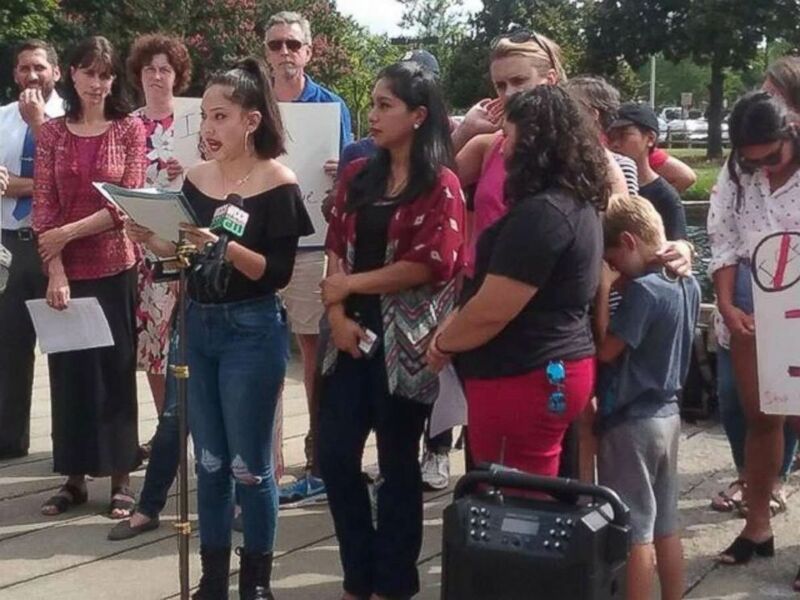 Maria (center, in red top) recounts the story of her arrest in a statement shared by Elisa Hernandez of Alerta Migratoria, an immigrants' rights group based in North Carolina. One of the agents flashed his ICE badge and explained why they were taking Maria, Little said. The Colombian immigrant’s attorneys asked ABC News not to use her last name because she is the victim of alleged domestic violence. “So I told Maria through the interpreter who was standing right near me that everything's going to be OK. She was hysterical, crying, very afraid." ICE arrested Maria July 9 because of the two pending criminal charges-- misdemeanor simple assault and misdemeanor larceny -- her alleged abuser filed against her, the agency said. ICE released her the same day, before the county dropped the two criminal charges against her two weeks later because of insufficient evidence, a Mecklenburg County official said. But as ICE steps up its enforcement actions, including at courthouses, experts warn that such arrests could have a chilling effect on immigrants' willingness to access and participate in the criminal justice system. Maria is now in removal proceedings, as are many others in Mecklenburg. The county has the fastest growing number of people with pending cases in U.S. immigration court; the number of people with pending cases rose 34 percent between May and December of 2017, according to the TRAC database maintained by Syracuse University. "There's this term 'crimmigration' to describe the way in which the criminal justice system is increasingly blending with the immigration enforcement system, and this is really what we are talking about," Professor Monica Varsanyi of the John Jay College of Criminal Justice in New York City said. It's very common for abusers to cross-petition or file charges against their victims. It happens all the time as a way to retaliate against the victim, whether it's out of shame or embarrassment or what have you. "We definitely found in our research that the places that were more enforcement-oriented, the places that chose to cooperate more closely with the federal government on immigration enforcement, it causes a chill in the relationship between the immigrant communities and the police forces,” Varsanyi, co-author of the book "Policing Immigrants: Local Law Enforcement on the Front Lines,” said. “In chilling the relationship between those two communities, it impacted public safety overall." And that is something that worries public defenders like Little. "If you have a situation where nobody comes to court because they are afraid of being deported, then where can anyone seek justice?" he said. Maria did not respond to ABC News' questions sent via her lawyer. Maria came to the United States in 2016 on a fiance visa, which requires visa holders to get married within 90 days of entering the country, according to U.S. Citizenship and Immigration Services. Maria and her then-fiance, Danny Melendez, did not get married but did have a son together. When Melendez allegedly became physically abusive toward Maria and her 16-year-old son, she decided to leave him. Melendez was arrested Jan. 10 and charged with misdemeanor simple assault, according to Charlotte Mecklenburg Police Department records. Maria was granted an emergency protective order against Melendez and fled to a domestic violence shelter, her lawyer said. In another hearing, she was granted a more permanent protective order against him -- and that's when Little said Melendez decided to file his own charges. "Maria and her older son faced physical abuse, definitely emotional abuse and abuse of the criminal process: using the criminal justice system to affect someone, to hurt someone, with no merit at all," Little said. "In that hearing, [Melendez] was told what could come about if that protective order was imposed by a judge. Right after that hearing, he went to the magistrate to get a summons against her. So that tells you how it was retaliatory. He knew what he was facing with that protective order." Melendez filed misdemeanor simple assault and larceny charges against Maria, according to court records. Little said among the belongings Maria was accused of stealing was the baby's crib. Melendez's attorney did not respond to ABC News' request for comment. I told Maria through the interpreter who was standing right near me that everything's going to be ok. She was hysterical, crying, very afraid. On July 9, Maria and her older son went to court to discuss the alleged domestic violence case in which they said they were victims and the charges Melendez had filed against her. Maria put her 2-year-old son in the court's onsite day care, Little said. When the meetings were over and the judge had moved to continue the case, Little started to head back to his office, he said. That's when he saw Maria and her older son being handcuffed. "He made it known to me that if I didn't back up, then he would take me into custody," Little said. "I thought, 'You should find out why she's in court before you just jump and take somebody into custody.' That puzzled me. "It was surreal. I knew they were kind of overstepping their bounds," Little added. U.S. Immigration and Customs Enforcement (ICE), agents detain an immigrant on in Los Angeles, on Oct. 14, 2015. But Little said his biggest concern was that Melendez, who had lost unsupervised custody of his son, would try to get the 2-year-old from the court's day care. Both he and the 2-year-old child have the same last name. Little said he asked a fellow attorney to follow Maria, her son and the agents to their car while he alerted the daycare. "I went to the day care at the courthouse and told them not to release the 2-year-old son to anybody but Maria," Little said. "I didn't know for sure she was going to be released that day but I just had the thought that the ex-fiance was kind of behind all of this. I was worried also the child would be taken into the Department of Social Services custody." Maria and her older son were released later that day and picked up the younger child from day care. She is now awaiting a court date in federal immigration court. ICE arrested Maria because of the charges Melendez had filed against her, agency spokesman Bryan Cox said, declining to comment on her son's case because he is a minor. "Bottom line: she was there as a defendant facing local criminal charges herself," Cox said via email. "You’ll have to ask local authorities as to why those charges were filed as ICE cannot speak to charges filed by another entity, but this fact is not in dispute." When asked whether the dismissal of those charges would affect her immigration removal proceedings, Cox said: "Not directly, as it remains the case she is unlawfully present in the U.S. However, it does impact the totality of the circumstances that will be evaluated when her case is considered." Cox also provided ABC News with a statement about the history of Maria's case. ABC News has redacted her last name from the statement because she is a victim of alleged domestic violence. "Unlawfully present Colombian national Maria [last name redacted by ABC News] was arrested by U.S. Immigration and Customs Enforcement July 9 in Mecklenburg County, North Carolina, during a targeted enforcement action following her court appearance as the defendant on misdemeanor criminal charges in Mecklenburg County. ICE briefly detained [Maria] to serve her with paperwork placing her into removal proceedings before the federal immigration courts and then released her on her own recognizance that same day after transporting her back to the courthouse," the statement read. "[Maria] legally entered the U.S. in August 2016; however, she subsequently failed to depart the country as required under the terms of her admission and she has been unlawfully present since the expiration of her visa in November 2016. A federal immigration judge will now decide her case," the statement continued. Lisa Diefenderfer, Maria's immigration attorney from the Charlotte Center for Legal Advocacy, said the mother of two should never have been arrested in the first place. "ICE said they arrested her because she's a danger and that's why they were after her, because she was there on a criminal charge," Diefenderfer said. "It's very common for abusers to cross-petition or file charges against their victims. It happens all the time as a way to retaliate against the victim, whether it's out of shame or embarrassment or what have you." For its part, ICE does not view courthouses as it does schools, churches or hospitals, which are all part of its "sensitive locations" policy that states that enforcement actions at these places "should generally be avoided." 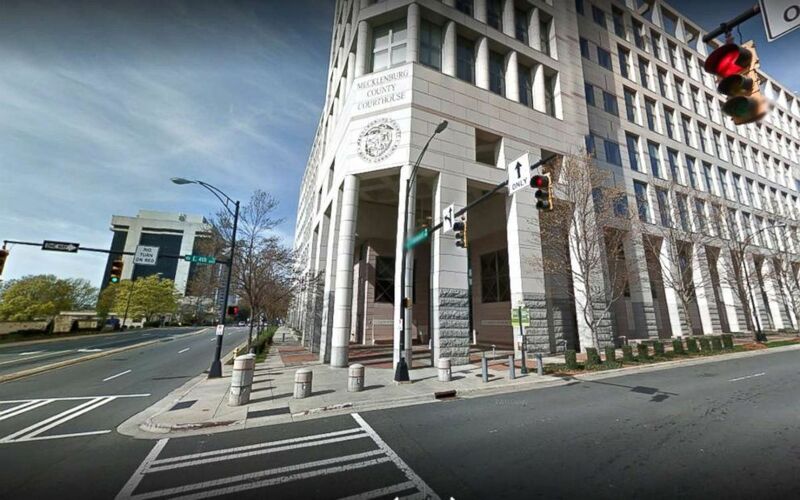 The Mecklenburg County Courthouse in Charlotte, N.C.
ICE's policy states it "will not make civil immigration arrests inside courthouses indiscriminately. ICE civil immigration enforcement actions inside courthouses include actions against specific, targeted aliens with criminal convictions, gang members, national security or public safety threats, aliens who have been ordered removed from the United States but have failed to depart (fugitives), and aliens who have re-entered the country illegally after being removed, when ICE officers or agents have information that leads them to believe the targeted aliens are present at that specific location." Advocates argue that Maria did not fit the requirements of a "public safety threat" and are worried about the message her arrest sends to other crime victims who are undocumented. If witnesses don't show up, that impedes the justice system and that doesn't make our society safer for anyone. If crimes can't be prosecuted properly, then what is the point? "She was a victim of domestic violence who came to court trying to seek justice and seek protection from her abuser and she was faced with retaliation from ICE," Stefania Arteaga, an advocate with Comunidad Colectiva, said. "I think it goes to show that they are trying to make an example of Maria." Varsanyi, the John Jay College professor, said her research bears that out. "If there's a person -- more often than not, a woman -- who has been a domestic violence victim, if she knows that her local police force is closely tied in with ICE and does immigration enforcement screenings, she would probably hesitate to get in touch with the police in that circumstance, and that's certainly what we found in our research," Varsanyi said. when you do have a close relationship between police and immigrant communities, that's when public safety is upheld more, and people who are actually criminals get brought to the attention of police as opposed to folks who are domestic violence victims. Diefenderfer, Maria's immigration attorney, also took issue with ICE's decision to release Maria's full name to the media because she is a victim of alleged domestic violence living at a shelter. Many domestic violence shelters do not publicize their addresses in case abusers try to retaliate against victims and their children. "Because they have already released many of her intimate details, if the wrong person says something about what her address is or the wrong document happens to get leaked, we notified ICE that they should not be listing her address on any of these documents because it is a domestic violence shelter, so that could endanger an entire shelter full of people," Diefenderfer said. Mecklenburg County had participated in a program known as 287(g), which gives certain local law enforcement officers the power to act as immigration agents and question individuals about their immigration status and make related arrests. But such programs have not made communities safer, professor Varsanyi said. "Whenever you hear from people who are more enforcement-oriented, they say, 'Well, we need to crack down on crime, we can't let criminals run free,' all these things you hear around sanctuary cities and so forth," Varsanyi said. "Empirically speaking, a lot of research has been done that demonstrates that's the complete opposite logic of what happens. That when you do have a close relationship between police and immigrant communities, that's when public safety is upheld more, and people who are actually criminals get brought to the attention of police as opposed to folks who are domestic violence victims." In May, Mecklenburg County voted in a new sheriff, Garry McFadden, who has pledged to end local involvement in 287(g). 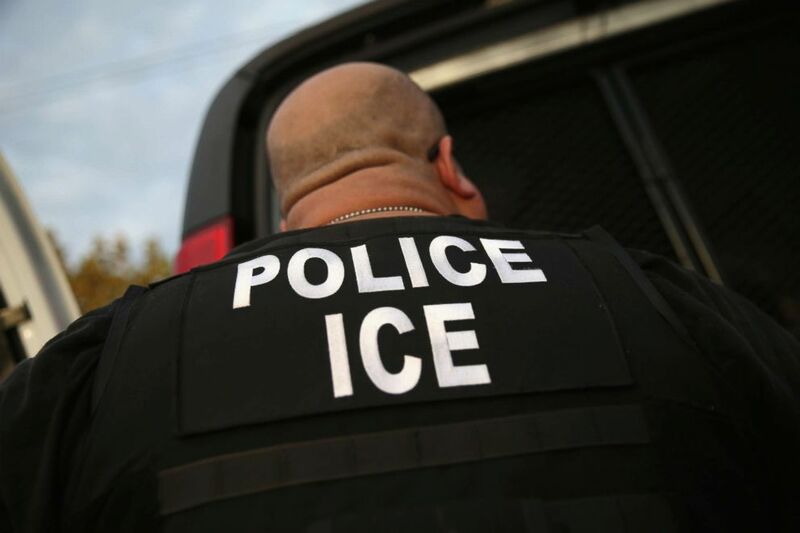 ICE responded with a statement opposing McFadden's move and saying that it means the agency will have to rely on sending agents out into the field to arrest people rather than arresting them at jails, ABC Charlotte affiliate WSOC-TV reported. Arteaga, the immigration advocate, said, "For us, it's extremely concerning, the actions we are seeing right now at the court. They're definitely sending a clear message that they do not believe immigrants should be seeking justice in any way, shape or form." Melendez, Maria’s former fiance, is due to appear in court Aug. 22 on the simple assault charge, according to court records. Maria is waiting to see whether she will be able to stay in the United States with her children, Diefenderfer said, something that is sure to be a long process. "It's certainly no guarantee,” Diefenderfer said. “It's certainly a pretty scary situation we're in right now with immigration in this country. There's almost zero discretion anymore, so they don't care when it's a humanitarian issue." The lawyer said she intends to apply for a visa for Maria that would make her eligible for a green card, but she hopes Maria won't be issued an order of deportation while that petition is pending. Her public defender Little believes federal immigration officials should let state cases play out before deporting people, he said. "I think that if a defendant or a victim is involved in the state criminal justice system, I don't believe immigration should be allowed to take any action on their status at all until that state criminal court case is finished," he said. "If witnesses don't show up, that impedes the justice system and that doesn't make our society safer for anyone," she said. "If crimes can't be prosecuted properly, then what is the point? If all this immigration enforcement is supposed to be keeping us citizens safer, then they are doing a poor job."